USPA NEWS - Legendary Table Tennis Player — Zoran Primorac visited the United States and the Westchester Table Tennis Center in Pleasantville, New York. 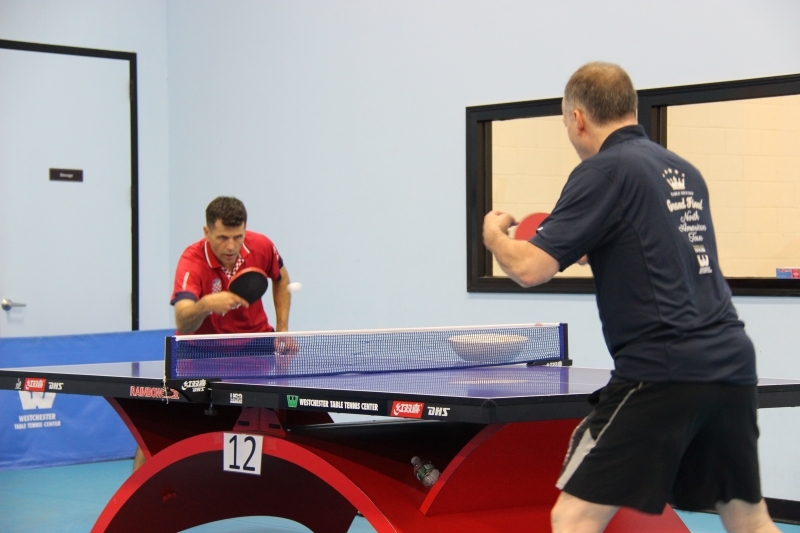 On the Sunday, June 18th, 2017 Zoran Primorac of Croatia — seven-time table tennis olympian, one of the most prominent and successful players in the world in the last 25 years, visited the Westchester Table Tennis Center in Pleasantville, NY. During this visit he conducted two training sessions, played exhibition matches with leading players of the club — Kai Zhang and Kokou Fanny. Pleasantly smiling, cheerful, easy in communication, nevertheless, thorough in the training sessions with his students, Zoran at the tennis table, taught and instructed table tennis players of different levels and table tennis skills, from beginners to advanced player, to table tennis teqniques. In his final advices for the groups, Zoran encouraged the students to come to tennis table with smile and to enjoy the game. Zoran Primorac, also, answered to the audience’s questions: “ When did you start to play?” — he answered — “When I was 7.5 years old.” To the question: “When was your last official match?”— he answered — “ Last time I played on the 2016 World Championships and I played well. “ Two weeks earlier I met Zoran at the ITTF WTTC 2017 in Dusseldorf, Germany, where he conducted one of the ITTF’s Workshops. So, I asked him, whether he had time to watch matches there and which of the matches did he like the most. Primorac replied, that the most he liked the match between Dmitrij Ovtcharov of Germany and Koki Niva, of Japan, especially Koki Niva’s play. “Which do you consider as your best matches?”, asked I Zoran Primorac. “I had a few of them”— Zoran replied — “ against Kong Linhui in 1997 and against Ma Lin in 2002, for example.” During this visit of Zoran Primorac to the USA, there was achieved an agreement to conduct a Friendly Table Tennis Match between the Team USA and the Team of Croatia at the Westchester Table Tennis Center, later in this year (see the schedule of the WTTC at http://westchestertabletennis.com/). This news was announced by Will Shortz, the owner of the Westchester Table Tennis Center. Mr. Shortz, also, read to the gathered in the WTTC audience the Greeting Letter from Mr. Josko Paro, the Croatian ambassador to the United States. The letter says, that Republic of Croatia valued relations with the United States and that the Friendly Table Tennis Match is considered to consolidate good relations between the countries. Mr. Mario Skunca, the Croatian consul in New York, attended on Mr. Paro's behalf. The Table Tennis Event at the Westchester Table Tennis Center in Pleasentwille, NY went in friendly and pleasant atmosphere with a special cake baked and dedicated to Zoran Promorac. The visit was arranged by Croatian rock star and a member of the Westchester Table Tennis Club Nenad Bach.